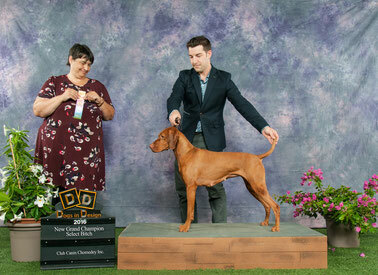 It's done, in only 5 weekend of show, Azha is now a conformation Grand Champion (Pending CKC validation). Vesper and I had to possibility to complete 4 titles throughout the weekend and we completed them all!! 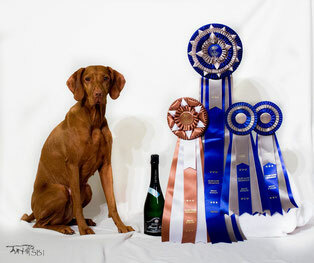 These title were not any titles either, we earned our Agility Champion title as well as a bronze expertise gambler title. 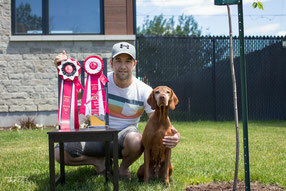 Good news, Vesper is officially pregnant. Indeed pregnancy was confirmed tonight with an ultrasound. Puppy Belly pictures to be posted in the coming weeks! On the 5th and 6th of January, Vesper will take part in and Agility / Frisbee competition at Complexe Multisports St-Eustache. 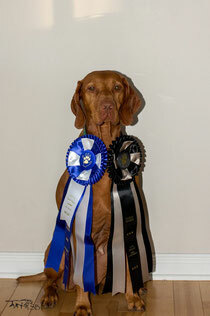 She will be competing in agility saturday and sunday as well as in frisbee on sunday evening. Check the calendar section for more informations. We will be at the Salon national des animaux de compagnie (SNAC) at the Olympic Stadium in Montreal on November 3rd and 4th. 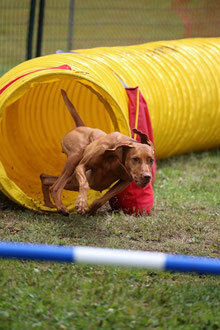 Vesper will be competing in agility and frisbee. Come and cheer for us! Check the calendar section for more details. 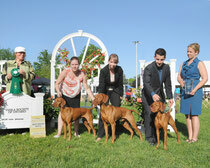 Vesper takes Best of breed in show #1 over 7 Vizslas including an American Grand Champion. 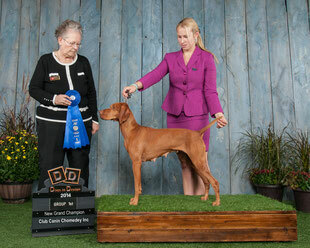 She completed her weekend with two Best of Opposite behind the male Grand Champion.